Photograph and text by Philip V. Allingham 2006. With its fan-vaulted ceiling reminiscent of Henry VII's High Gothic chapel at Westminster Abbey and its Romanesque pulpit of Italian marble, recalling the work of the Pisanos at Pisa, the riotously ornate interior of St. Malachy's is in sharp contrast to its rather plain, red-brick exterior, described on its plaque posted on its wrought-iron railing outside as "Elizabethan-Gothic." The exterior design of Thomas Jackson was chosen over thirteen others, "a superb example of Sir-Walter-Scottery at its most romantic" (Brett and McKinstry): its twin turrets and arrow slits suggest more the Tudor castle than the Gothic cathedral. 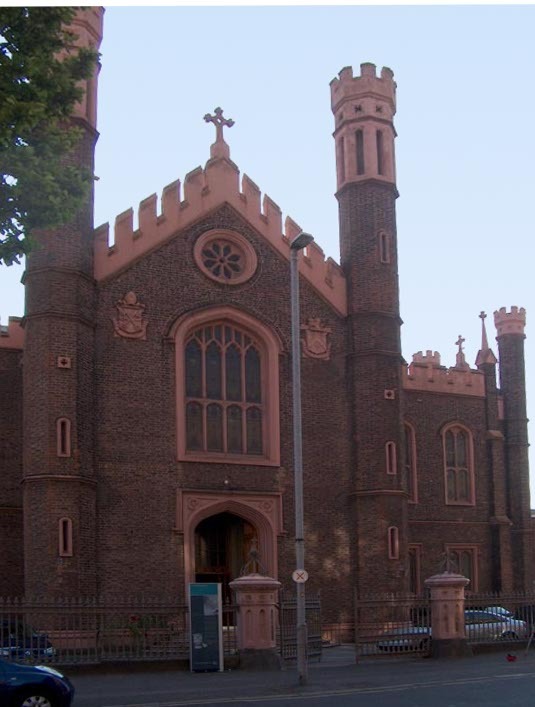 Nevertheless, St. Malachy's was originally considered as a potential cathedral for the Diocese of Down and Connor to serve the burgeoning Catholic population of Belfast in the 1840s. Construction began with the laying of the foundation stone on 3 November 1841, on the feast of St. Malachy, the £5,678 cost over the next three years partly underwritten by Captain Thomas Griffith's bequest of £3,000 and the gift of the land by a sympathetic Presbyterian, Adam McClean, to Hugh Magill "in trust for the Catholics of Belfast" (Heatley, 66). The altar is the work of Felix Piccioni, whose family were political refugees from Austrian Italy. The organ, installed by the Telford family of Dublin, is said to be one of the finest of its kind in Northern Ireland. Archbishop William Crolly, the primate of the diocese, consecrated the church in December 1844. Belfast Welcome Centre. Plaque in front of St. Malachy's Church. Transcribed from digital photograph 3 September 2006. Heatley, Fred, and Gillian Boyd (il). Belfast: Paintings and Stories from the City. Donaghadee, Northern Ireland: Cottage Publications, 1998. Brett, C. E. B., and R. McKinstry. "Alfred Street, Belfast: St. Malachy's Church." Belfast: Ulster Architectural Heritage Society, 1971. Extracts on Virgin.net accessed 3 September 2006.